I don’t know but today I will try to find out. Join me, as I start this series on what is leadership, what leadership means to me, why we need good and bad leaders in our lives, plus a whole lot more. 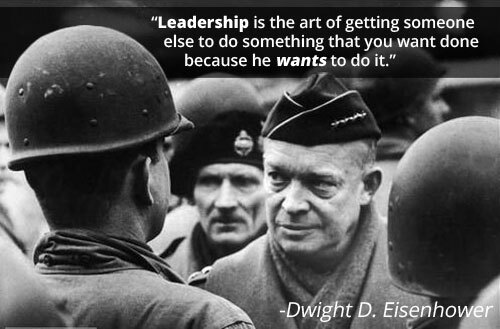 Eisenhower’s quote is by far the greatest definition of what leadership is. Now, let’s answer the question of what is NOT leadership? For some of you, what you are about to read may go against what you may have been taught or what you have done up to this moment. First and most importantly, Leadership has absolutely NOTHING to do with seniority or position in any organization. Next, it has absolutely NOTHING to do with title. You can be the CEO but your receptionist is the true leader. Leadership also has absolutely NOTHING to do with being dominant, alpha attitude, or stature. Of course, Leadership has absolutely NOTHING to do with management. The last word in the Army Field Manual’s definition is the answer as to why leadership exists: organization. The organization (any organization) is the reason for the need to have leaders. Someone has to be the first person in the organization and someone has to take charge and be the one that people turn to. Unfortunately, the first person and the one to take charge is NOT always the same person. While the founder might have the vision it takes someone to make that vision a reality. There are many CEOs, Founders, or Presidents that have the vision and the ability to guide others to make it happen. Then there are far too many CEOs and Founders that could not lead people out of a wet paper bag. To be a success, an organization will need a solid, no-nonsense vision and a person or people that can make that vision become a reality by leading others in that direction (the mission). I cannot make this any clearer but here I go again, sometimes the CEO or Founder(s) might not be the leader of people. They may lead or manage the organization but it takes a special breed of individual(s) to step up and step in to lead others. 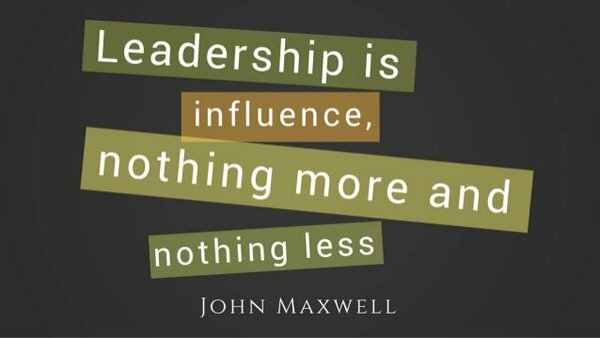 Influence is at the heart of leadership. When it comes to influencing others, either you have it or you don’t. This I truly believe. Influence and having the ability to influence others is one of those rare gems that some people are born with and others cultivate, over time. Having the “capacity to have an effect” are five words jam packed with so much potential energy that to ignore it is ridiculous. Unfortunately, too many people have no real grasp of the amount of influence they exert on others. Unfortunately, those that have an idea of the potential they have usually use that power for bad. When was the last time you heard of the school bully using his influence to get kids to pick up the trash in the playground or when did the “popular” girls, in high school, use their influence to encourage all the kids to get involved in righting some social injustice that is occurring right across the street from school? You are correct; it does not happen in real life and for it to happen the “popular” girls would lose their status especially after being glamorized in popular entertainment, think “Heathers“, “Mean Girls” or the “Chanels” from short-lived television series “Scream Queens”. I could on and on citing famous bullies through entertainment history but then again who will pants Eugene in the locker room? Yep, time to move on. HOW DO YOU KNOW WHEN LEADERS HAVE INFLUENCE? In case you find yourself in a situation when you or some other leader is getting stuff done that is a huge indicator that a leader has influence. Yes, it is that simple. It is so simple that it begs for a more intensive deeper explanation. Most individuals that want to blame something or someone else will give you that more intensive explanation. However, those that are too busy getting things done have no time for anything else but making sure those things, whatever they may be, are getting done by themselves and those they are influencing to get things done. HOW DO YOU KNOW WHEN LEADERS DO NOT HAVE INFLUENCE? Now when you walk into room and find life has been sucked out of it and nothing is being done, especially when something needs to be done is when there is no leadership influence occurring. When leaders have no influence, they have absolutely no right being called a leader. They probably do not even deserve being called a manager if they hold a management position. When a room (or group, department, organization) is lacking influence it is most certainly lacking a leader. Do not be that person. Be the person that is willing to step up and be a leader that will exert influence to get the job done. HOW DO YOU CULTIVATE AND GROW YOUR INFLUENCE ABILITY? You work at it. You constantly work at it. Now, cultivating and growing your influence ability is not about stepping up every time, it is about letting others step up. It is about learning from others. By others, I mean the good ones, the bad ones and the ones that are learning. The ability to influence others is one of those leadership traits that not only has to be cultivated but cultivated for the rest of your life. Cultivating leadership traits is something not to be taken lightly. There cannot be an “I’ll get to it later”mentality. Leadership is something that one cannot put off to later. Once you start on that path you are on it for life. Yes, Leadership is lifelong whether you are in a position to influence others or not. You choose to take that step onto the path of Leadership there is no going back. You might as well do what you can to make yourself a better leader and those around you, as well. P.S. This page will be updated continuously.